James Bond is the perfect role model to base your suit wardrobe on. These seven suits are not just essential suits to have for a Bond-like wardrobe, but they are seven essential suits for any wardrobe. “The clothes say so much about Bond. He’s got a naval background, so he needs a strong, simple colour like dark blue.” This genius line is what the least fashion-conscious James Bond actor Timothy Dalton said about what James Bond should wear. 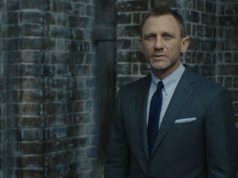 Though Bond’s preferred suit colour in the films is overwhelmingly grey, the original Bond of Ian Fleming’s books usually wears a lightweight worsted dark blue suit. This worsted navy suit is the single most useful suit a man can have, and the literary James Bond is never poorly dressed in his. If a man has only one suit in his closet, this is the suit it should be. The typical man today only needs a suit for three purposes: job interviews, weddings and funerals. A solid navy worsted suit is completely appropriate for all three. This suit should ideally be light to medium weight (about 9 to 11 oz) in a twill weave or a plain weave, with the latter being better for warmer climates. The navy must de a dark shade of blue, but it should not be so dark that it is mistaken for black. Midnight blue is too dark for the daytime and may look too serious, but it can ultimately serve the same purpose that a navy suit can. Marine blue is too flashy. 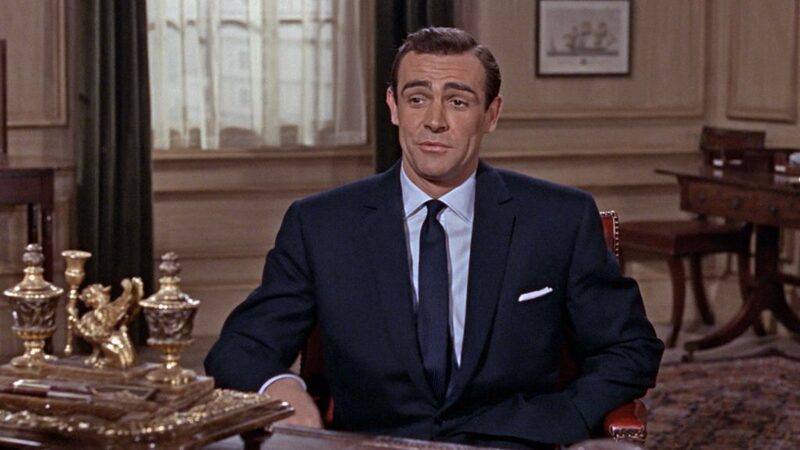 In the films, James Bond rarely wears a simple worsted solid navy suit, but he wears a few that come close. 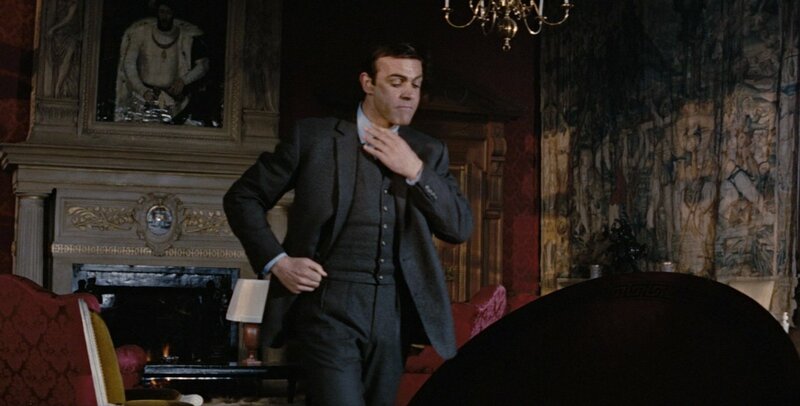 The navy suit that Bond wears to the office in From Russia with Love is a worsted flannel, which is an even-twill worsted milled to have a nap. It’s a great choice for cool weather in a heavier weight, and has a bit more durability than the classic woollen flannel. In On Her Majesty’s Secret Service and Skyfall, Bond wears navy worsted herringbone suits. These can easily take the place of a twill or plain-weave worsted but have the added subtle texture of the herringbone weave. A subtle birdseye weave/pattern like what Pierce Brosnan wears in all of his Bond films could also work for those who want something a bit more interesting, but it’s important that there be little contrast in the pattern so the suit will have the most versatility. James Bond wears flashier blue suits of mohair and wool blends in darker and lighter blues than navy, but such suits are not as versatile and are best saved only for social occasions. The solid charcoal suit is the second most versatile suit, which is great for business and for funerals. Because it is more neutral than navy, charcoal may be a slightly better choice for funerals and for interviews. But that’s splitting hairs. However, no matter how nice a charcoal the suit is, it has a colder look than navy, which is why the charcoal isn’t as good as navy is for social functions. Some people believe that charcoal should be a man’s first suit rather than navy, but both are reliable choices for a first suit. A worsted wool suit in a twill or plain weave like mentioned for the first navy suit above is most versatile, with herringbone also a possibilities. It should be light to medium weight (9 to 11 oz) for a year-round use. A purely solid piece-dyed charcoal can look boring, so it should have a slight variation of greys in the weave. 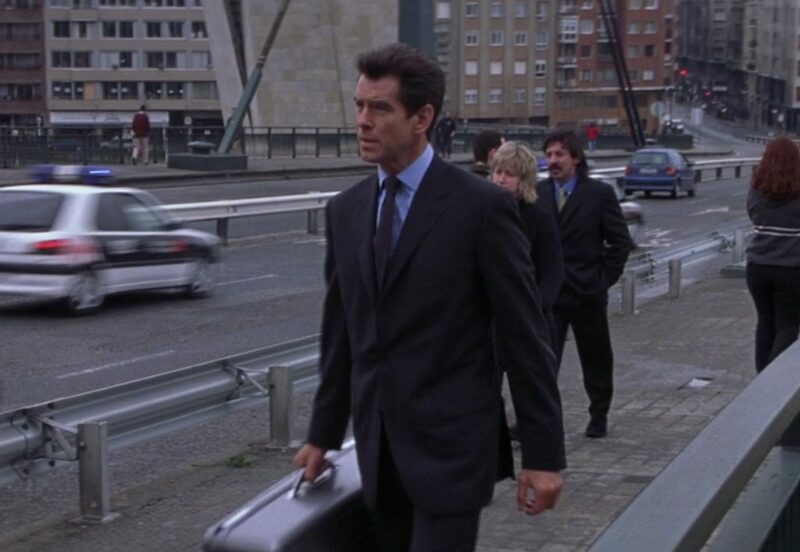 Pierce Brosnan’s worsted charcoal suit in The World Is Not Enough is the perfect charcoal suit, and it’s subtly seasoned with bits of blue and brown to liven and enrich the charcoal. Bond often likes his charcoal suits in woollen flannel rather than a hard-finished worsted to give a warmth to such a cold colour. Woollen flannel is an excellent choice in cooler places like Great Britain, but it is not so versatile in places that have a lot of warm weather if it’s only a second suit. Also known as pick-and-pick, the black-and-white sharkskin suit is an excellent Bondian suit to have for mild to warm weather. Sharkskin combines two colours in even amounts for a cross-hatched look with a slightly iridescent effect, even if it is made of pure worsted wool. When equal amounts of black and white are combined, the end result is medium grey but with a more exciting look than solid medium grey. The iridescent look of black-and-white sharkskin makes it a suit that doesn’t look quite right in cold winter weather, so it’s best to get it in a light to medium weight (8 to 11 oz). It makes for a great suit to wear to daytime summer weddings or even to offices in more creative fields. Daniel Craig’s black-and-white sharkskin suit in Skyfall brought back the look to modern fashion, but it was previously known for its popularity in the 1960s. Sean Connery wears a similar suit in Thunderball, likely in a mohair and wool blend. In From Russia with Love, Sean Connery wears a darker grey sharkskin suit made up of two dark shades of grey, which has a more subtle look that may be more office-appropriate than black-and-white and can look appropriate in any season. This darker sharkskin suit is less interesting, but it may be more useful to those who need more suits for work. The striped navy suit is the classic business suit. A navy worsted wool with grey pinstripes or rope stripes in a light to medium weight (9 to 11 oz) for year-round wear or a navy flannel wool with grey chalk stripes in a medium to heavy weight (11 to 16 oz) for cool weather are all excellent choices. James Bond usually prefers subtle light grey stripes rather than bright white stripes, which can often look too flashy. Bond also likes blue stripes, which are more fashionable and bolder than grey stripes but not as bright as white stripes. The navy striped suit is perfect in a three-piece, and Bond’s navy striped suits are more often than not three-piece suits. Daniel Craig’s navy track-stripe suit in Casino Royale is a great example of the modern striped suit, which has a more subtle stripe. Sean Connery’s navy flannel chalk stripe suit in From Russia with Love is by contrast a more old-fashioned looking striped suit, but it has a softer, friendlier look that is a good suit for daytime social occasions. The dark grey woollen flannel suit sits in tone between the charcoal suit and the black-and-white sharkskin suit, and it’s the ultimate cool-weather suit. It is perfect as a three-piece suit for additional warmth. Being woollen flannel, it’s a more relaxed suit that is still appropriate for most cool-weather suit-wearing occasions. It’s ideal for a cold office, for a holiday party or for a funeral. A flannel suit should be medium to heavy weight (11 to 16 oz). Lighter weight flannels exist, but they have little body and poor durability. This is a favourite suit of Sean Connery’s Bond, who wears it as a three-piece suit in Goldfinger and Thunderball. Bond also likes his grey flannel suits in medium grey and charcoal. It is not a useful suit for those who live in warm places, but it’s an indispensable Bond classic for those who can benefit from the warmth it provides. The grey glen check suit is a fun suit to have in your wardrobe, and it is a Bond favourite. There are different types of glen checks, from the larger Glen Urquhart check to the finer plain-weave glen check to the finest glen hopsack check. James Bond has worn all of these types of glen checks. The larger the check and the more contrast there is within the check, the sportier the suit is. Adding an overcheck (like a windowpane) will make such a suit even sportier. Darker, smaller and more subtle glen checks are appropriate for the office as well as for more fun occasions. The glen check suit, especially a suit with a bolder check, is great for garden parties and other low-key daytime events. This suit can be in any weight. Like the flannel suit, the grey glen check suit is a staple of Sean Connery’s Bond wardrobe. Connery wears five glen check suits in four of his Bond films. 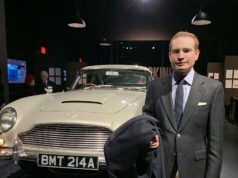 These include the famous three-piece suit in Goldfinger, which is a grey and white glen hopsack check. The glen hopsack check or the plain-weave glen check like on Sean Connery’s checked suit in Dr. No breathe better warm weather than the twill weave Glen Urquhart check does. George Lazenby’s black-and-white glen check suit with a blue overcheck is one of the sportiest glen check suits James Bond has worn, due to the larger scale of the check, the contrast within the check and the added overcheck. Daniel Craig’s charcoal blue glen check suit in Casino Royale is, by contrast, on the other end of the glen check formality, with a dark colour overall and the subtlest check. Daniel Craig’s black and grey glen check suit in Skyfall is a happy medium. The check is large enough to notice, but the subtle and dark colour combination brings it to the dressier side of glen checks, meaning that it can be worn to the office. A blue glen check, like what Daniel Craig wears at the beginning of Spectre, can be an alternative to grey. A dinner suit (tuxedo) is a necessity for the James Bond suit wardrobe, and Bond’s preferred colour for it is midnight blue rather than black. Midnight blue is an extremely dark shade of blue that looks blacker than black under artificial light at night. During the day, midnight blue looks like a dark, rich navy, whereas black will look more green or brown. Midnight blue is not bright marine blue, which people have come to mistake it for due to the oversaturated Skyfall poster. Because midnight blue is more a type of black than a type of blue, it is interchangeable with black when it comes to evening wear. Thus, a midnight blue dinner suit is equally appropriate whenever a black dinner suit is. James Bond has also worn black dinner suits from time to time, so a black dinner suit is not off the table. The suiting should be either a barrathea worsted wool or a wool and mohair blend in a light to medium weight (9 to 11 oz). A blend with mohair makes the suit shinier and more breathable. It should have either peaked lapels or a shawl collar. Notched lapels are less desirable because they make a dinner suit look closer to an ordinary suit. Since James Bond has not worn a dinner jacket with notched lapels since Licence to Kill in 1989, the style is effectively outdated. The lapels can be faced in either black or midnight blue (to match a midnight blue dinner suit), and in either in satin silk or grosgrain silk. Both the jacket and trousers of a midnight blue dinner suit should be in matching midnight blue. James Bond has been wearing midnight blue dinner suits since the start of the series in Dr. No and as recently as in Skyfall. Sean Connery’s dinner suit in Thunderball in a shiny wool and mohair blend is especially timeless and elegant. 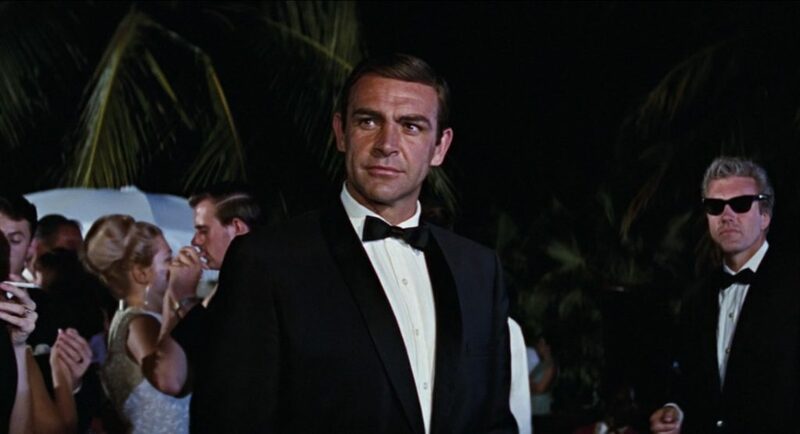 The midnight blue dinner suit subtly sets James Bond apart from most people who wear black dinner suits, but it allows him to fit in with those who dress well. Depending on your needs, different suits may be better than some of the suits listed above. A marine blue or midnight blue wool/mohair blend suit may be more useful than a navy stripe suit (№ 4) for someone who has little need for suits to wear to the office. A light grey tropical wool suit or a light grey linen suit is more useful than dark grey flannel suit (№ 5) if you live in a warm climate. A grey rope stripe suit may be a better choice than a glen check suit (№ 6) for someone who needs more traditional business suits. For people with a warm complexion, one of the grey suits could be replaced with a brown suit. A sand and blue check suit like what Pierce Brosnan wears in GoldenEye is an especially flattering suit on people with a warm complexion. Like what James Bond usually wears, these suits are most versatile in single-breasted button two, button two show one (three-roll-two) or button three styles. The suits can also be in button one or double-breasted styles if you are able to wear a more adventurous style, but it’s best to have at least a solid navy or solid charcoal suit in one of the more conservative styles. The exception is the dinner suit, which must only have one button if single-breasted. For 100% wool suits, Super 110s and Super 120s wool have the perfect balance of durability, resilience, drape and hand, for the ideal performance and value. Wool and mohair or wool and silk blends are great for social suits. Cashmere is best avoided in suits. This article is meant to be a guide to help one select a versatile and Bond-like suit wardrobe. The guide is meant to be flexible, and two people who follow this guide may not end up with exactly the same suits. The suit wardrobe listed here is not ideal for everyone and merely offers a well-rounded list of suggestions. Excellent work – as always! Only one remark: The CR blue-striped suit IMO is not a very good example (with regard to cut and details – i.e. belt with waistcoat etc.). Neither are the Skyfall suits. But it’s more balanced the way you did it. The article focuses on the suitings rather than on the suits themselves. You know I don’t recommend belts with waistcoats or shrunken suits! Matt was right to include these. The suitings in the last two films are some of the best in the entire series and it would have been a waste not to reference them just because the costume designer screwed up the fit! 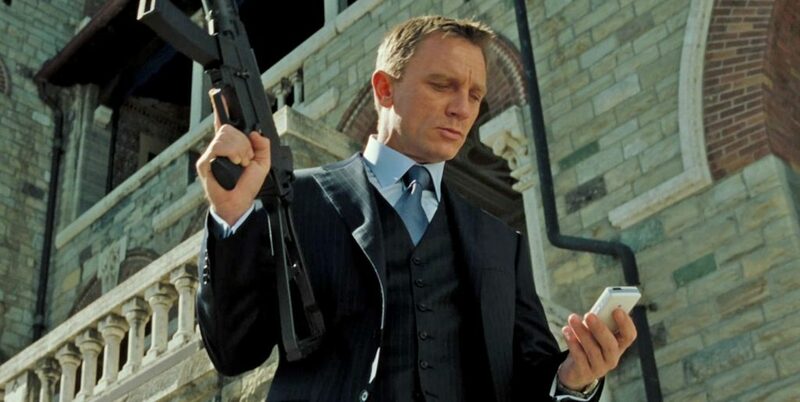 Amazing, I swear I’ve read the article about the navy-charcoal suit in Casino Royale but I never noticed it was a check pattern. Has that always been the case or was that a recent correction? Regardless, this is a brilliant article and will actually help me with my obsession with patterned suits. I have so many bold checks, herringbones, and stripes but so few simple solid suits. There’s a place for them and I really need to give them the recognition they deserve. This guide will help me prioritise what I need. I think I may have corrected that one after it was originally published, but that was a few years ago. 🙂 I wouldn’t presume stating the contrary! Excellent article for the man who would be Bond, at least sartorially. By far your most excellent piece especially to a pauper like me. I try to follow your rules to the best my budget allows me to, but in the world gentleman’s style who does matt spaiser consider a leading authority? I notied you referenced aLan flusser alot, anyone else besides him? Bernhard Roetzel has written excellent books as well. By the way I saw your photo taken with mr.lazenby himself. Excellent choice on the dinner suit. Finally a man who practices what he preaches. Ever thought of doing an article on what you wore that night? I would really enjoy reading that. I was drinking Bond’s favourite beverage, Champagne! I don’t think I will write about what I wore that night, but I might share a photo of the black tie outfit I wore last night, which was similar. Great article Matt and a good guide to those only starting to build a Bondesqe wardrobe. My only criticism is not a lot of Roger Moore (the fun Bond), but you can’t have everything. Plenty of Connery, Craig and Brosnan though, who are my favourites, even though I have a soft spot for Roger. Roger Moore may not be pictured here, but he wore half of the suitings shown here. That is true, We all like to see Roger’s handsome mug though, what an icon. I never realized Daniel Craig’s charcoal blue suit was actually a glen plaid. I have a navy, medium blue and brown glen check suit which I think is unique. It is a good suit for the office, but also for a social event as well. Great idea for one of your (00)7 articles Matt! Where does a tan/beige warm weather suit fall into such a selection? It can take the place of the flannel suit or glen check suit if it’s more useful to you than one of those might be. There has just been one fantastic article after another lately! Very interesting and inspiring! The Timothy Dalton quote regarding the navy suit is indeed spot on and I have always felt that as bad as his wardrobe is in his two films, especially the latter one, Dalton himself gets too much blame for it IMO. As has been pointed out before, most – if not all – of the unsuccessful clothing choices in his films is a matter of poor execution of a good concept. If one where to list the clothes from TLD and LTK on paper it would look like an ideal Bond wardrobe in terms of colours and dressing apropriately for the setting and situation. Not only true to the books but to the cinematic portrayals we had come to know as well. And this is where Dalton certainly knew how the character would dress and apart from not wearing a tie with his bussines suits in LTK (there is no excuse for that and Dalton is responsible for this as well), it really seems to comes down to the specific garments that where chosen to fill the “roles”. CD Jodie Tillen wanted to dress Dalton in pastels for LTK wich he would not go along with and we can all be thankful for that. Unfortunately, his eye for cut and style appears to not be refined enough to demand better in those aspects, wich is unfortunate. And to paraphrase Vesper Lynds remark, “There are dark blue suits and there are dark blue suits”. This is one of most important articles of the blog because it lays down the foundation of what we should have or at least gives us an idea of what we should go by. However now that the blueprint has been laid out how about giving us a hand with the neckties? I’m sure many neckties have different meanings when being worn with the same suits. Any chance an article like that could be in the making in the near future? Some of the choices bond made when choosing his ties were completely beyond me. I’ve actually been working on a neck tie piece, though I’m afraid I cannot give you a list of essential neck ties because I don’t believe there is one. This is because neck ties are very personal. Connery’s dark navy grenadine tie is the only tie anyone ever needs since it goes with almost anything. You can wear it with the first six suits listed here. I believe the essential Bond ties are grenadine and knitted. I would recommend everyone own the ties Connery wears: navy, black and brown in both grenadine and knitted variants. It’s not an exciting tie wardrobe, but anything more exciting should be a more personal choice. Matt what do you think the chances of Daniel Craig playing Bond again. I’d say in my opinion about 80 percent chance at the moment. I think it’s a lower chance. It could be, but no one has been announced as taking over yet and Craig said in an interview last year that he really like playing Bond. Have you ever seen Craig out and about in New York ? I’ve never seen him. He has actually been to the place I work for, but I didn’t see him. I live a block away from Sean Connery’s son Stephane C. Connery, where Sir Sean spends a lot of time. Yet I have not seen him either. Try this. .. many times I find suits made by extremely small companies but they use reputable mills such as loro piana and zegna to name a few. Say saks fifth Avenue, I will see a suit that’s part of the store brand but the suit utilizes cloth made by zegna. Awhile back I purchased a suit frim the saks line that was made out of loro piana fabric for around 400 USD, while my cutter was selling the bespoke version of this using the exact same fabric for around 1950 USD. Is it really the cloth? Or the brand? My cutter would always stare at the individuals who would bring in suits from sears and expected the suits to fit like a suit from campagna. To make a long story short these customers would start blaming My cutter for the poor fit and My cutter would explain to them that the cloth will tell him what he can and cannot do, so is it really just the cloth? – Three 2-button suits with double vents in mid grey Glen check with blue windowpane, navy birdseye, charcoal grey. A grey pick-&-pick and a navy stripe were ordered last month and are on their way. As I am not that tall, flapped pockets are slanted, some with ticket pockets, and cuff have 4 kissing buttons. The only flash thing is the linings that are a bit wild. Trousers have flat fronts, side adjusters (how practical and comfortable !) and cuffs. I also have a navy blazer in serge with 3 metal buttons on the cuffs (and a bright orange lining, sorry) made like the other jackets with nice grey flannel trousers. – Grenadine ties in a variety of shades (navy, navy, navy, purple and red) complement the look. It appears we have the same idea of an essential wardrobe ! I guess the flannel suit is missing but I may go for a summer suit instead (beige gabardine or linen). I have an old black off-the-rack DB dinner jacket that still fits and too few opportunities to wear it to have it replaced. It is not of a bespoke tailor quality, but it is fine for daily use and frequent business travel (no belts or cufflinks to think of when packing or passing airport security). That sounds like a perfect wardrobe! Being French myself and currently trying to improve and rebuilt my wardrobe, would you mind if I ask you where you ordered your suits and shirts ? We seem to share similar tastes. Shirtmakers (ready to wear or made to measure) providing nice turnback cuffs shirts are especially difficult to find in France, I think. I am from Paris myself. I use Tailor Corner. It is of course not fully canvassed, the shirts are no Turnbull & Asser, but it is good enough for my everyday use. Good when you are more on a budget. They have shops in Paris (in La Défense among others) and in my home town of Reims. They are mainly web-based (as many other cheap MTM makers) but have some shops where they measure you. The attendant in Reims was skilled enough to get the measures right on the first try. I do not know how good they are in Paris. Try the cheapest range and adjust. Nice cocktail cuffs for shirts. Cotton Society, Lib & Stael and Saint Sens also do “poignets napolitains” but I have not tried them. For suits, some of my colleagues go to Gambler near La Madeleine. Sorry for readers across the Channel or the Pond ! These 007 articles are really some of your best, Matt. Congratulations. If you had to replace the dinner suit by a lounge suit, what would you choose ? I know you listed several alternatives but what would be your number one choice ? And about the solid navy suit in FRWL, what make you decide it’s a worsted flannel ? Could it not be a simple thick serge suit, or even a woolen flannel ? I ask because while the striped suit is clearly a flannel one, for this other suit we didn’t get some very accurate pictures. Thanks and keep the great job ! I would replace the dinner suit with a marine blue suit. It’s a classic that is currently trendy and is great for social occasions short of black tie. The blue suit in From Russia with Love has a nap, but I can make out a twill weave in some shorts. That’s why I think it is worsted flannel. Do you think it’s possible in the near future to an article bond type of color combinations? I would like to say that each bond wore certain types of colors more than others. The colors the colors…..
I’ll see what I can come up with. There are certainly different methods Bond uses, and I have covered some before. For instance, Brosnan has a lot of combining blue and brown. I do have a query, beg your pardon for posting it here, but i could not find another method. Coming to point, i suppose you must have seen the film, Kingman: The Secret Service? Colin Firth’s suits in that film are Savile Row bespoke and look superb, timeless and needless to say, elegant. Could you draw a comparison between those suits and Sean Connery’s suits? Are they alike? Or are they subtly different? Colin Firth’s suits are nothing like Connery’s. His double-breasted suits (as opposed to Connery’s single-breasted) are stiffer with more shoulder padding and a leaner cut. Connery’s suits are softer and more full-cut. 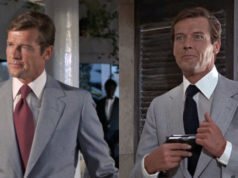 Roger Moore’s Italian suits in The Spy Who Loved Me and Moonraker are closest to what Firth wears, though they are missing the English flair of Firth’s suits. Ah, yes..all of Mr. Firth’s suits were double-breasted. I wonder what his single-breasted ones would have been like. Just one more thing, by saying that the suits are stiffer or softer, are you referring to their overall shape? As in a stiffer suit would have a shape of its own while a softer one would follow the contours of the body? Or is it that stiff is a tight fit & soft is relatively loose fit? Or is the fabric? Despite being single-breasted or double-breasted, Firth’s suits have a stiffer and heavier inner structure, they have more shoulder padding, and they fit closer to the body. Matt, the navy flannel chalk stripe suit in From Russia With Love looks really businessy to me. Especially since it is a dark colour, to me it looks more like a strict business suit then the subtle navy stripe suit at the end of Casino Royale. You mention that flannel should be 11-16oz. Mason and Sons just put a dark grey flannel on their website which I am interested in getting. It’s 9oz. Is that a problem? Thanks for your time. I enjoy reading your blog. I don’t think it’s ideal, but it’s probably okay. Flannel will wear warm regardless of weight, and it can be too delicate in such a light weight. The lightest flannel I have is 11 oz, and it already feels very light. To follow up from this, I’m planning on buying the Oliver Wicks Spywear charcoal flannel suit soon. They don’t list the weight of the fabric, but call it light. Then again, they list the grey glen check as a winter suit so I’m not sure I trust them in this exact regard. I understand you picked at least some of the fabrics yourself, Matt, can you vouch for the quality of the flannel? I think it’s an 11 oz flannel. I got some trousers from them in that cloth and they have been excellent. I already own the midnight blue dinner suit and I am steadily on the way to owning my very own solid navy suit both from Mason & Sons. Anything on the essential shirts to own along with fabrics/cloths?